Our brain works through the activity of its almost 100 billion neurons that each collect, process and pass on information in the form of electrical signals. But so far, not much had been known about how the differences in the properties of these cells from person to person matter for human cognitive abilities like intelligence. 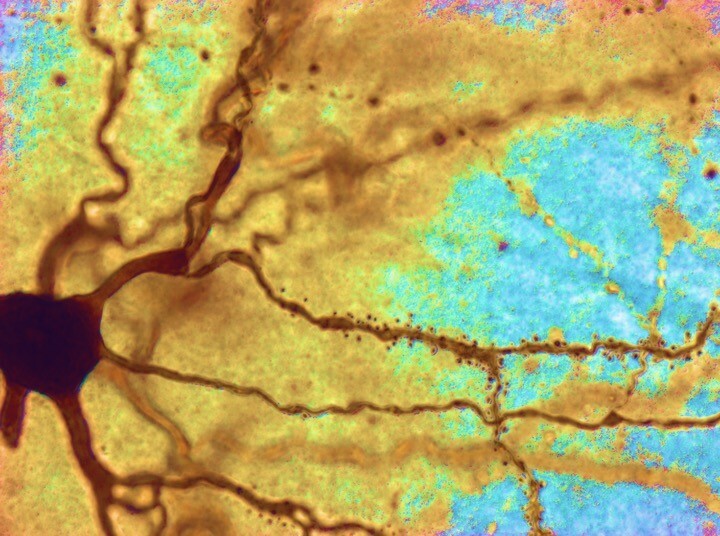 Some evidence had suggested that the size of so-called dendrites, the long branched out protrusions through which each neuron receives signals from thousands of other cells, might play a role: Especially in brain areas that integrate different types of information, such as the frontal and temporal lobes, brain cells have bigger dendrites. In these brain areas the cortex, where most of the neurons are, is also thicker in people with higher IQ. Theoretical studies additionally predicted that larger dendrites may help cells to initiate electrical signals faster. But because of the very difficult access to human living neurons it was an open question until now whether any of these cellular properties could be proven to actually relate to human intelligence. A collaboration of basic neuroscientists at the Free University Amsterdam with neurosurgeons and clinical psychologists at Amsterdam University Medical Center now made it possible to find out whether smarter brains are indeed better equipped with faster and bigger cells. “The study is the first to take the single cell perspective and link cellular properties to human intelligence”, explains senior author Prof. Huib Mansvelder, an expert for cellular neuroscience who is working within the Human Brain Project. The Dutch team studied 46 people who needed surgery for brain tumors or epilepsy. Each patient took an IQ test before the operation, as part of a presurgery assesment. To access the diseased part deep in the brain, surgeons commonly have to remove small undamaged samples of temporal lobe. These samples still contained living cells that the scientists studied. Both the size and dendritic complexity of the cells, as well as their electrical signals – so called action potentials – were measured in the lab and compared with the IQ scores. They found that cells from people with higher IQ have longer, more complex dendrites and faster action potentials especially during increased activity. With computational modelling they could also show that neurons with larger dendrites and faster action potentials can process more information coming in and can pass more detailed information on to other neurons. 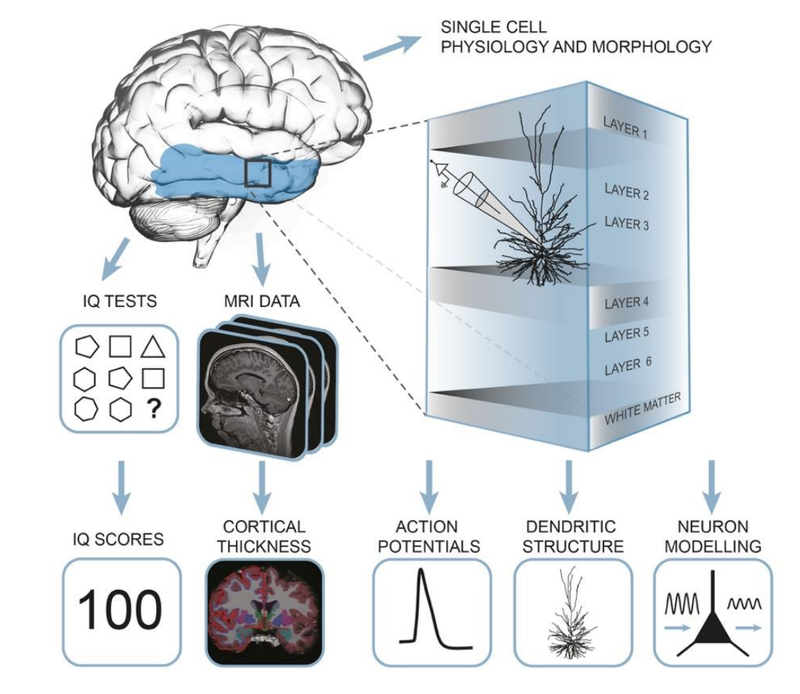 “Traditionally, research on human intelligence focuses on three main strategies: brain imaging studies of brain structure and function, genetic studies to find genes associated with intelligence, and behavioral psychology”, explains Huib Mansvelder Behavioral psychological studies have shown that higher IQ scores are associated with faster reaction times of subjects. The new findings provide a cellular explanation for this association and links findings from the separate approaches, explaining how identified genes for intelligence can lead to increased cortical thickness, larger neurons as well as faster reaction times in people with higher IQ. Faster action potentials and bigger dendrites to receive and process more synaptic information may seem like a small difference between neurons. However, since our brain consists of close to 100 billion neurons, this effect rapidly multiplies to a large effect on the computational potential of the brain as a whole: “It’s a small step at the level of a single neuron, a giant leap for the computational power of the brain”, says Mansvelder. Prof. Huib Mansvelder heads the Department of Integrative Neurophysiology at the Free University of Amsterdam. His research team is leading in areas like single cell modelling and measurements on living human neurons. In the HBP he contributes to the research area of Human Brain Organization, which studies the complexity of the brain from the level of gene expression and molecules up to the high-level phenomena of cognition.